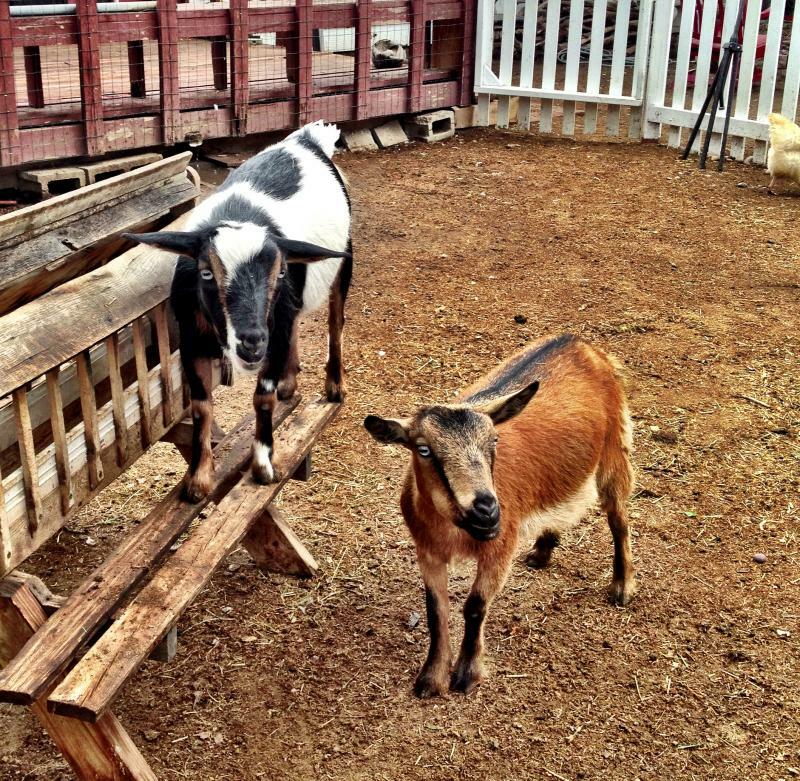 Goats: The New Wave of Urban Agriculture? 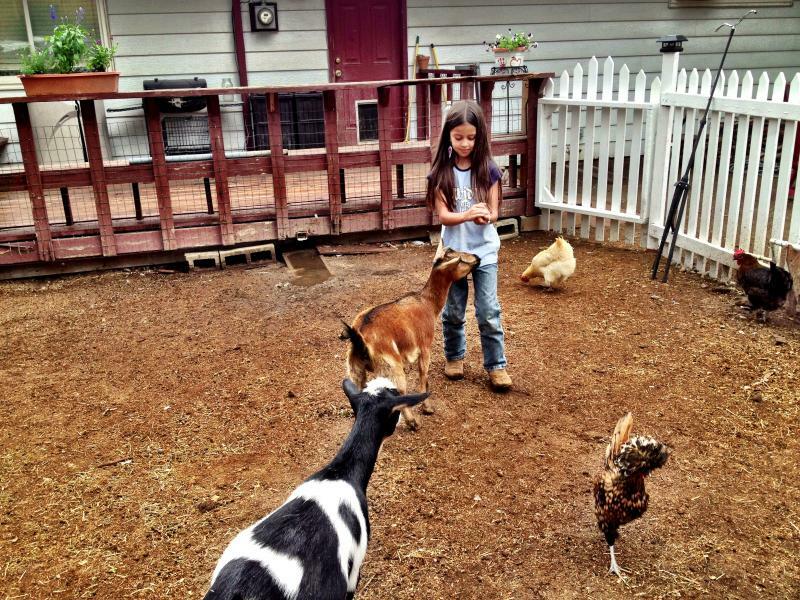 With interest in urban homesteading on the rise, some traditional farm animals are showing up in city back yards. It started with chickens. Miniature goats might be next. While some worry about potential health effects, KRCC's Liz Ruskin went to one backyard east of downtown Colorado Springs to meet a woman who isn’t concerned. Monycka Snowbird lives in a densely packed neighborhood of 1960s-era ranch and split-level homes, some with tidy yards, some overrun by weeds. Her adventure in backyard farming began a few years ago with fowl: a pair of $4 ducks led to a $300 coop, followed by an assortment of exotic-breed hens. Then, last year, Snowbird added two goats. They’re Nigerian Dwarfs, mini dairy goats, no bigger than Labrador retrievers. Penelope and Clementine can each produce a quart of milk a day. She assumed they were legal in the city. "Our chicken ordinance has been in place forever," says Snowbird. "We can have chickens, we can have ducks, we can have bees—one beehive per city lot. You can sell your produce on your own property as long as you don’t put up signage. We have so many progressive things about urban agriculture here in the Springs. I didn’t know we couldn’t have goats." The city does allow goats, but only on lots of nearly an acre or more -- five times larger than the property where Snowbird and her family live. She’s gotten one ticket, but it was tossed out on a technicality. Now she’s out to change the law. “No goats, No Glory,” is her campaign slogan and her dedicated Facebook page. Snowbird's found a champion in city Councilwoman Jill Gaebler. "I do think that there’s kind of a renaissance of homesteading," Gaebler says, "that more and more people are finding food that they buy in the supermarket to not be up to the standards that they expect." Snowbird's daughter, 8-year-old Isabella, collects eggs, identifying which ones came from which chickens. Monycka Snowbird says it’s important to her that her children appreciate the process. "They’re out here learning this is where their food comes from," says Snowbird. "If we take care of the animals, they take care of us. And, we should be able to produce as much of our own food for our families as we can." As for goat milk, Snowbird isn’t one to overplay the benefits. She used to make goat cheese, but she says a person can only eat so much. Now she mostly makes goat soap. Though the goats are adored members of the family, Snowbird is frank about the downsides to owning them. Some goats trim lawns and eat weeds. She says hers will eat prized blueberry bushes but are otherwise quite finicky. "When Clementine was little she was terrified of sod," Snowbird says. "We’d take her to the park and farmers markets and she’d walk on her hind legs because she didn’t want her feet to touch the sod. They are princesses for sure." They bleat for her attention, so she can’t sleep in anymore. Still she says she’s on good terms with all of her neighbors save one. And with occasional egg distributions she’s met more of them than in all the years before she kept farm animals. Councilwoman Gaebler says she sees the ability to raise dwarf goats in the city as a matter of property rights. "We do allow potbelly pigs, up to 100 pounds, for no particular reason. We allow snakes – up to 100 snakes. Up to 10 chickens." So she figures why not goats? She says only female goats would be allowed, since males are louder and smellier. She’s studying the goat ordinances of Denver and other Colorado cities as possible models.